ARCHAEOLOGISTS of the Chinese Academy of Social Sciences have finished reconstructing a 5,300-year-old pottery statue from fragments unearthed in North China’s Inner Mongolia Autonomous Region, it was announced Saturday. 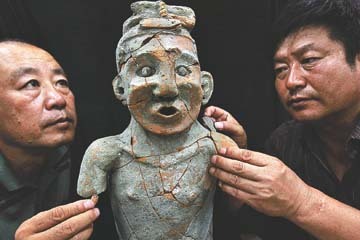 The debris of the pottery statue were found at the Xinglonggou relics site in Aohan Banner of Chifeng City in May. Experts began to excavate the debris June 30, and finished restoring the statue on Friday, said Liu Guoxiang, leader of the first archaeology team of Inner Mongolia. The restored seated figure is 55cm high with bulging eyes, a high nose and vivid facial expression. It was pieced together from 65 fragments. “The statue may be of a wizard or leader in the famous Hongshan Culture period (a Neolithic culture dating back 5,000-6,000 years),” added Liu. The three look quite similar:-D.
Interesting, some of their jade objects look like these ducky looking pokemons/objects Asian like so much.Even a bit Pre-Columbian.Honestly I always have wondered to what degree Art&Culture is actually inherited by racial factors,be it in/direct through physical appearance or something even deeper. So looks quite European, but also is reminiscent of Peruvian or some Maya stuff also?! That bro looks like a Native American or a European. The statue is clearly Mongoloid as evidenced by the facial flatness and shallow-set eyes. I'd have to see the statue in profile to say if the face was flat or not, but judging from the photo face-on, it definitely seems protruding to me - look at the shadows cast?? The left-eye also seems deep set and round - so European. East Asian eyes usually bulge slightly, often beyond the plane of the face - that is certainly not the case here. The shadows prove that the face is flat, not the opposite. If the malars were receding they wouldn't be casting a shadow, would they? One can also notice the high position of the eyebrows. This is a Mongoloid face. I meant the shadow of the nose on the cheeks. Yes the malars are wide. The statue actually looks like a combo of the two men in photograph.As to the round eyes, I noticed that some Asians give me the impression that their iris is much larger and rounder than other folk,likely because the iris&pupil look like a single black structure. So the eyes of the statue looks like the man to the right, performing a magical facial expression.